Australian-made plastic grid turf and substrate stabiliser that has a huge variety of uses and applications. Come and see on site at The Kandanga Farm Strore - home to Bos Rural at Kandanga. GEOHEX Erosion Control System is an Australian-made plastic grid turf and substrate stabiliser that has a huge variety of uses and applications. Being independently certified by Good Environmental Choice Australia (GECA), GEOHEX Erosion Control System is a cheaper and more environmentally friendly substitute to concrete and bitumen-type products. As a cost-effective surface stabilisation and erosion solution for soil stability problems, GEOHEX Erosion Control System has been designed to prevent erosion, stabilise infill material and control shearing, lateral and vertical movement in a wide range of soil and substrate types. By increasing the effective structural integrity of soils, GEOHEX Erosion Control System creates a stiffened base layer that provides increased load support whilst preventing soil subsidence and soil erosion. GEOHEX Erosion Control System improves safety on the edge of roads, embankments, parking areas and many other medium to high traffic surfaces. With a maximum load bearing capacity of 1200t/sqm* and made from recycled and recyclable interlocking polypropylene hexagonal cells, GEOHEX Erosion Control System is suitable for use in just about any type of ground and geological conditions. 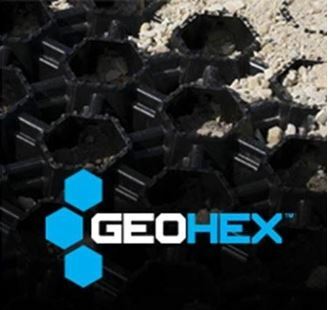 With its innovative plastic matting construction and unique connection system, GEOHEX Erosion Control System can be laid quickly and cost-efficiently, either in linear or bend sections in any weather and at any time of the year. Its rigid structure and strong polymer construction enables GEOHEX Erosion Control System to be used as a walking grid to provide a cost-effective solution to prevent soft ground build-up and mud control in heavy traffic livestock areas and shed flooring. Price listed is per sqm. There are 2 Geohex panels per 1sqm. We can arrange delivery to your site - contact us for a freight estimate. *results are based on a filled product, Tested at the Centre for Geotechnical and Materials Modelling, The University of Newcastle. Copyright © 2019 Bos Rural Supplies. All rights reserved.